When you create your blog or when you start a blog with WordPress or Blogger. The first thing in your mind is how to get traffic on blog. So, to increase traffic on your blog you have to submit sitemap to various search engines like Google, Bing, Yahoo etc. You just have to create sitemap for your blog once and then you have to submit it to search engines. So, they can keep the record of your updated post and can crawl and index your blog. So, till now you've understood how much it is essential to create your blog sitemap and submit it to Google Webmaster Tools and Bing or Yahoo Webmaster Tools for faster crawling and indexing of your site. So, you can get more and more organic traffic from these search engines. So, now lets see how to generate sitemaps for our WordPress blog. In WordPress, there are many free WordPress plugins are available to generate XML sitemaps. But here we will take the example of best xml sitemap generator called Google xml sitemap generator for WordPress. This is very simple and used by many WordPress bloggers to generate sitemaps for there blogs. Google sitemap generator helps you to generate sitemaps for WordPress blogs. It is compatible with all the top search engines like Google, Bing, Yahoo, Ask.com etc. So, this plugin will generate a special XML Sitemap which will help search engines like Google, Bing, Yahoo, Ask to better index your blog. This plugin is free and you can download Google XML Sitemap Plugin from here. This plugin is supported since over 9 years and rated as the best WordPress Plugin. It has also got 4.7 stars out of 5 stars. 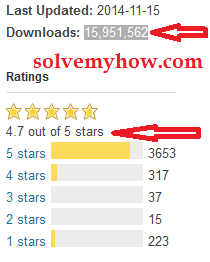 Already 15,951,562 people had downloaded this plugin. Regular upgradable with updates in search engine algorithms. rated as the best WordPress Plugin. Compatible with all search engines. Once you downloaded Google xml sitemap generator plugin. Go ahead create sitemap for your blog and submit it to major search engines. Below mentioned two articles will help you in submission of sitemap of your blog. So, this was all about how to create sitemap for WordPress blog. Just download it, create it and submit it. Do let me know if you are facing problem in creating sitemaps for your WordPress blog in the comments below and if you like this post then don't forget to subscribe for SolveMyHow Newsletter to get the answer of every HOW into your INBOX !